A few years ago we were traveling in Portugal and passed through a beautiful town called Óbidos in central Portugal. Óbidos, an old Roman settlement, was repeatedly bequeathed by Portuguese kings to their queens as wedding presents. The town is also known for a famous 17th century painter called Josefa de Óbidos whose baroque works are still on display there. Few women outside Joan of Arc have had their name survive beyond their times. So it was a surprise to see Josefa’s name survive and being still celebrated. Óbidos features an aqueduct still well-preserved from the late middle ages. The combination of its history touching on women (Queens & Josefa the painter) and the aqueduct made me reflect on the technology behind water distribution and it’s effect on humanity and the effect of subsequent technologies on humankind. Let us look at some of them here. Our water supply is a technological marvel. From prehistoric wells to organized collection and distribution to modern day plumbing and water utilities, it has come a long way. So much so that we take it for granted. 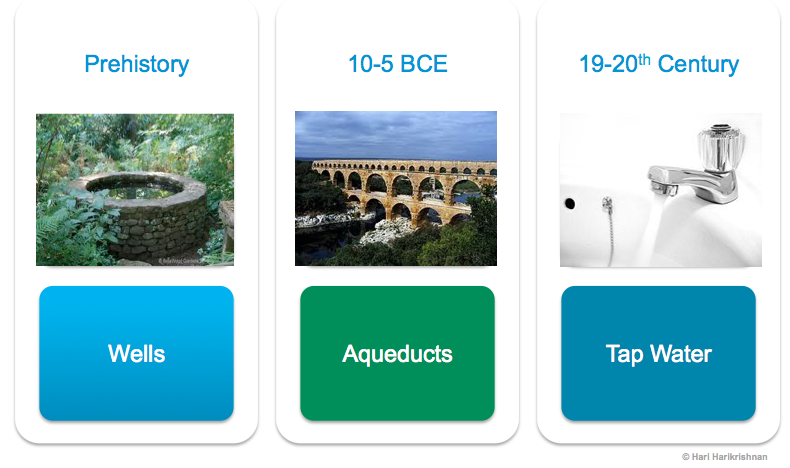 Examples of how water was tamed and used over our history include aqueducts that existed in BCE in various parts of the world and made more predominant by the Romans, large cisterns to hold water like the one under Basilica Cistern in Istanbul built by Emperor Justinian I, use of running water in the Alhambra palace etc. Some key aspects in the journey to water utility is depicted below. It is a journey from on-premise water generation to on-tap availability using off-premise collection and distribution. Of course, I am glossing over details like how old plumbing technology is and how current-day efficiencies in distribution are achieved. The technology of collecting, transporting, and distributing water caused social change . Running water changed the lot of humans, especially women, freeing them from the chore of fetching pails of water. The relentless human innovation is seen in other technology evolutions that we take for granted today — Gas and Electricity. See the graphic below on how we took each of these technologies from on-premise to off-premise (to the “Cloud”) and made them available on tap. 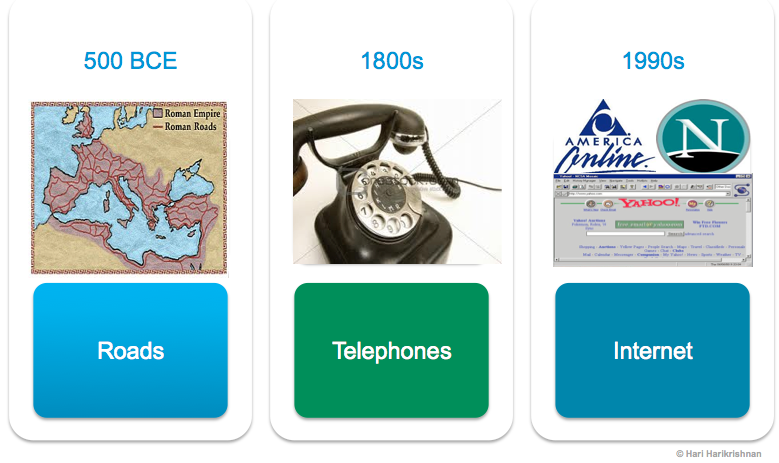 So what current day technology evokes the same utility model? The evolution from digging wells to getting water supplied on-tap is similar to on-premise computing vs getting computers or processing power on-tap. 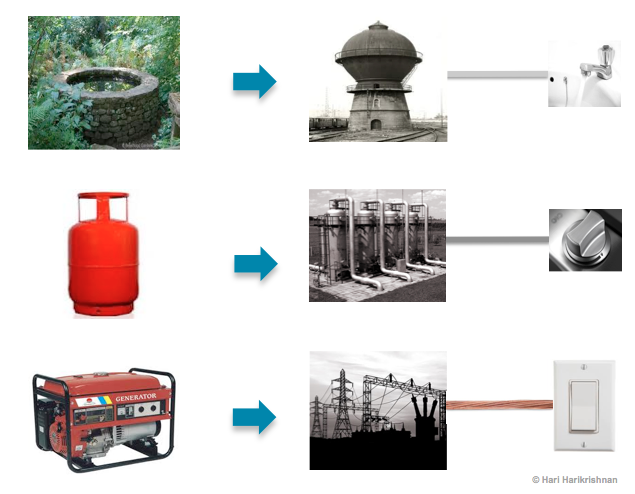 This tale of four “cloud” technologies – water, gas, electricity, and computing – makes me wonder about parallels between the older technologies and the latest one in its infancy. What did a hybrid cloud look like in a previous era? Below is a hybrid cloud (combination of off-premise and on-premise technology to enhance reliability or efficiency) for electricity supply – an on-premise gas-powered generator backing up the main electricity supply. Here is an example of how we improved reliability of a utility using multiple clouds and a combination of off-premise and on-premise technologies – a gas-utility powered electricity generator that provides back-up power in case main power supply fails. It is trite to say history repeats, but the journey of humankind continues from cloud technologies to newer cloud technologies, each being provided as utilities for easy consumption. So what is the next human need that will be met from the cloud? We could look at Maslow’s hierarchy of needs to predict what is on tap next? Health and safety are already on that menu, but not all needs are not known a priori. Internet, which is fast becoming an essential need and on its way to the bottom of the pyramid of human needs, being a prime example. Finally, what changes will new utilities like computing bring to humanity? Will they be as significant as the effects from having running water? Once in our future we will look back at the Internet and deem it as mundane as running water. Just as the Romans could not have anticipated the Internet when they made aqueducts, we may not fathom what lies ahead in a thousand or even hundred years. In Part II of this series of posts on utilities we’ll look at other critical utilities that have reshaped our world and continue to do so.